The game was Breakaway™. This year our team devised a unique control system with a lighted hat, nicknamed the “H.U.H.” for head’s up hat. When wearing the hat the driver had small LED lights indicating when a ball was in the kicking mechanism and when the robot was lined up to the goal. In autonomous mode our robot was capable of scoring from any position. Field connection problems left us frustrated at the Greater Kansas City Regional. But as in 2007, we learned to persevere. Our programmers worked with excellent volunteers at the event and we went on to win the regional. A second blue banner was proudly displayed. We came close to bringing home a third blue banner at the Minnesota 10,000 Lakes regional, losing in the finals, but earning the Innovation in Control Award. We were thrilled to make it to elimination rounds in the Newton Division of the FIRST Championship. Prior to kick off, we learned that we lost our build space once again. We were getting close to kick off when we made arrangements with Valley Lutheran School in Cedar Falls to use some of their empty space. We hung tarp and purchased space heaters to keep the space warm enough to work. Once set up, we liked our new “Doghouse”. Breakaway™ is the 2010 FIRST FRC game. 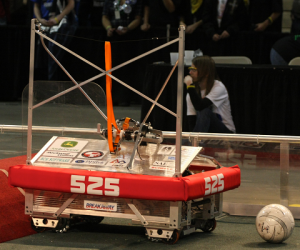 The game consists of two three robot alliances playing a variation of soccer on a 27 by 54 foot rectangular field. However; this field has raised bumps, towers, tunnels and 2 goals at each end. As a goal is scored, the human players have a set amount of time to get the ball back into play before a penalty is assessed. The HYBRID PERIOD starts the match with the robots having an opportunity to kick the balls and score before the drivers take control. This year a camera was allowed on the robot so you could see what the robot sees.